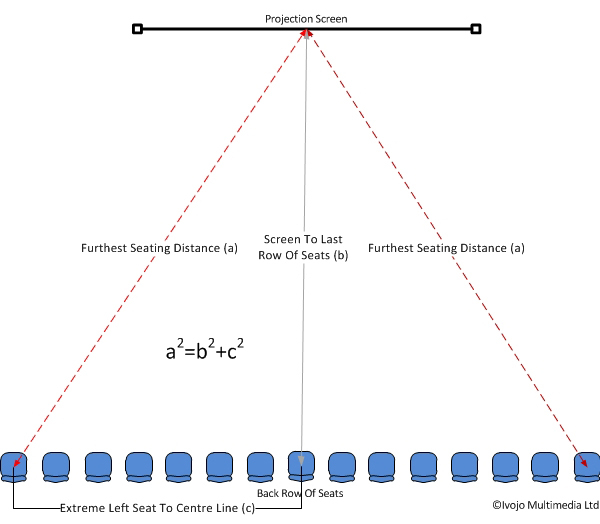 Choosing the Right Projection Screen Size. An article from Ivojo Multimedia. 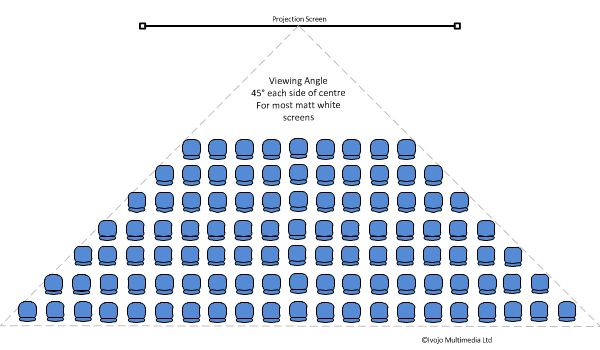 There is a fairly simple rule of thumb for calculating projection screens sizes in offices, classrooms and lecture theatres. The height of the screen should be as close as possible to 1/5th of the distance to the furthest seated audience member, so in a lecture theatre, if the furthest student is 10 metres from the projection screen then the screen should be 2 metres high. Bear in mind that the furthest audience member will not be the one at the back of the lecture theatre or training room perpendicular to the middle of the screen but those seated in the back corners. 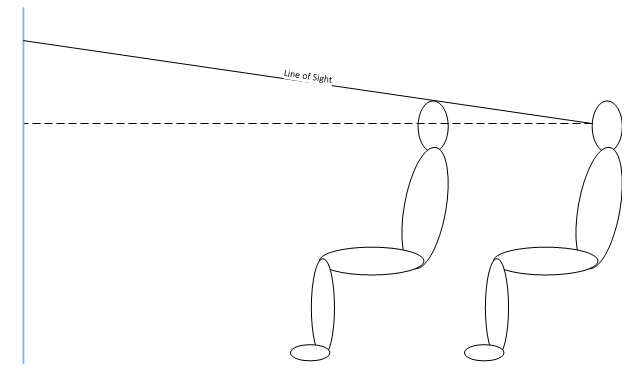 In other words, measure from where the centre of the screen will be to the back corners of the room or use Pythagoras' formula to calculate the distance (click the image on the right for a closer look). If we take a 10x10 metre room then we can see that the furthest student will be just over 11 metres from the screen so ideally we need a screen just over 2 metres high. If your meeting room/lecture theatre does not have tiered seating then you need to minimize (preferably eliminate altogether) the amount of screen being blocked from view to anyone from second row back. We would generally recommend at least 1.5 metres from floor to projection screen and preferably more if possible. An important consideration when planning your installation is the viewing angle of your audience to the screen. If you imagine a large letter "O" projected onto a screen then it will look like an "O" if your are sitting directly in front of the screen but will become elliptical as you move to either side. Once your angle to the screen becomes greater than 45° text will quickly appear so narrow that it will become indecipherable. Although the brightness of modern projectors has reduced the requirement, you can still get high gain projection screens which reflect more light than matt white but in a narrower viewing cone. This means it is almost invariably better to purchase a brighter projector rather than trying to compensate for a dimmer one. Recent developments in projection screen manufacturing processes have yielded matt white screen with a gain of up to 1.5 whilst maintaining the same viewing cone as older screens.